Catherine Edwards is leading a team that has received a five-year, $750,000 grant from the Southeast Coastal Ocean Observing Regional Association (SECOORA) to establish a regional glider network. The team will work collaboratively to operate regular glider missions in the South Atlantic Bight, providing valuable information for data assimilation and ocean modeling, as well as to fisheries and other stakeholders. This will include regular maps of temperature, salinity, density and other measurements. In addition to regular coordinated experiments with multiple gliders and maximum regional coverage, the project will leverage opportunities to develop regular transects in areas where glider data may be of interest. 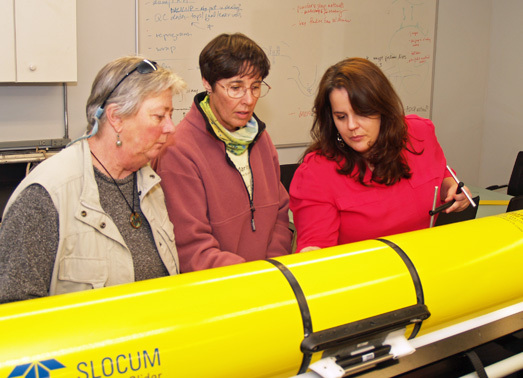 Catherine Edwards (r) explains the workings of the glider to Mare Timmons (l) and Mary Sweeney Reeves. Co-PIs include Chad Lembke from the University of South Florida, Ruoying He from North Carolina State University, Harvey Seim from the University of North Carolina and Fumin Zhang from Georgia Tech. Other partners/stakeholders include state Departments of Natural Resources and the South Atlantic Fisheries Management Council. Gliders will be outfitted with passive and active acoustics data that fisheries managers can use to better understand key species. Data will be shared freely and made available in near-real time through SECOORA and the National Data Buoy Center. “We’re sending all of the glider data to the National Glider Data Assembly Center in near-real time so that it can be assimilated into the Navy’s operational models to improve their forecasts,” Catherine said. This entry was posted in Marine Science, Oceanography, Research, Science, Scientific Research, Skidaway Institute, skidaway scoop and tagged gliders, nasa, noaa, secoora, skidaway institute, south atlantic bight. Bookmark the permalink.